Mom life is busy. And as much as you may stick to a nap and sleep schedule, it’s unpredictable, too. Things vary much more in my day-to-day life now than they did when I worked in an office. These days I don’t even know whether I’ll leave breakfast unfinished or end up with an unexpected leisurely hour to blog. Which is why I love my morning ritual. 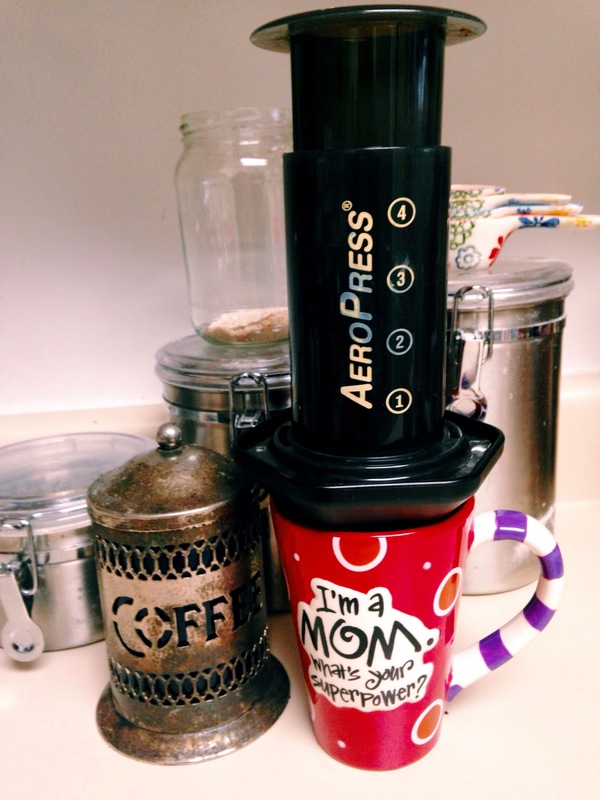 It’s so simple: I make a cup of Aeropress coffee. From the time I turn on the kettle to the time I press my coffee into my mug is five minutes, and I can do it even wearing a grumpy baby. But having this simple, structured ritual helps me feel grounded somehow. I love waiting for those 30 seconds between pours, measuring the water just right, because those things don’t change morning to morning, and they force me to pause and breathe. When I have time, my ritual is extended to reading my Bible and devotional study in the same corner of the couch by our amazing windows. I love that time. But if all I have is those five minutes, it’s ok. Sometimes I finish my coffee cold an hour later, and that’s ok, too. Because my ritual is complete. A secret? Mom superpowers are actually fueled by cold coffee and half-finished chores. If you don’t have a ritual, try establishing one. Pour a cup of full-leaf tea; play a favorite song while you sit and do nothing til it’s over. It will add a sense of peace and calm to your day, whatever else happens. If you don’t have a press, get one! I promise, it is SO worth it. That $25 gadget will spoil chain coffeeshop coffee for you forever, unless it’s Peet’s, of course. And in case you don’t know how to make the perfect cup of Aeropress, I’ll share this brew guide from Stumptown. It’s different than the directions that come with the press, and it makes the smoothest, most wonderful cup of coffee. Do you have a daily ritual? I’d love to hear it! ← Eighteen steps to putting two almost-toddlers to bed. Amen!! I think incorporating and finding joy in these little rituals is great for anyone’s sanity. You are a Supermom and I loved your optimistic and true words about how the half finished things and cold coffee fuel those superpowers. I think it’s a sign of God’s grace and you banking your value in Him versus what you check off your list. It’s a lesson I’m learning and will forever struggle with, but hopefully an area I’ll mature in. I’m not a busy mom, but I’m a busy wife and employee. 😉 A different season with its unique struggles. I thank God for your heart and what He teaches me through you!